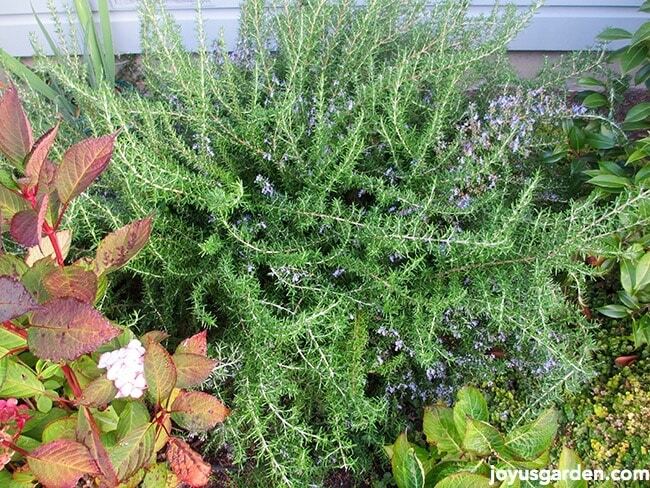 Rosemary is a wonderful herb as well as a beautiful plant to use in the landscape. It comes in quite a few forms, sizes & has many uses. Here's what you should know about growing it. Oh yes siree, rosemary is wonderful! It’s a woody perennial evergreen herb that’s commonly sold as a shrub and is a member of the mint family. This is such an attractive plant to have in the garden and comes in a few forms, many sizes and is versatile and easy. Here’s what you should know about growing rosemary. 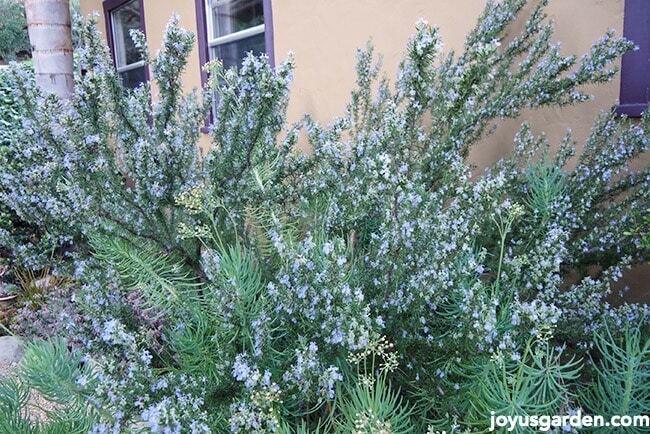 The Rosemary “Tuscan Blue” was 1 of the anchor plants in my front garden in Santa Barbara – it grew to 6′ tall by 9′ wide. Now that’s 1 big herb! I moved to Arizona a couple of months ago and just had to do a video and post on this ginormous plant before I left. It’s 1 of the largest rosemarys that I’ve ever seen so how could I not? The forms that it comes in are upright, ground cover or trailing and a combo of the 2. The most commonly sold upright rosemarys are Tuscan Blue (which is mine), Tuscan Spires, Golden Rain (I also have this 1) and Miss Jessup. A few of the trailers include Irene, Huntington Blue and Prostratus (which is the commonly sold trailing rosemary). The crosses, which have growth habits of both upright and trailing which some refer to as “semi trailing”, are Collingwood Ingram, Ken Taylor and Boule. 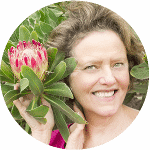 Rosemary, like Aloe vera, is a plant with purpose. Its pungently scented foliage, which is like a wake up call when inhaled, has many uses. It’s beneficial both internally and externally and is frequently enjoyed in the culinary trade – professional and home chefs use it in many ways. The 2 favored for taste are “Tuscan Blue” and “Tuscan Spires”. I prefer to use the tender new growth for cooking. 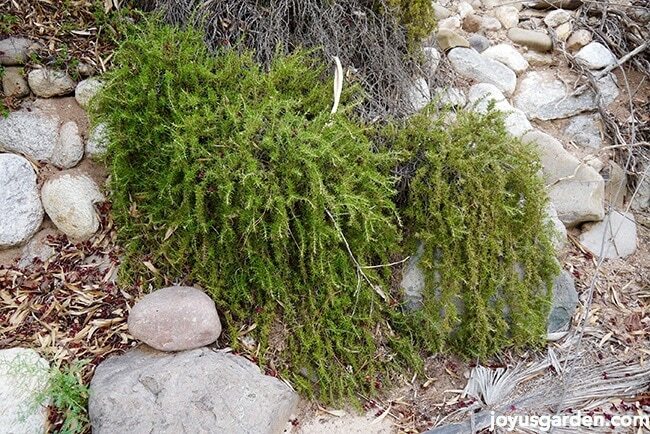 This is Rosmarinus officinalis “Ken Taylor” – it both grows upright & trails. Exposure: Rosemary does best in full sun. It can take morning shade but needs that midday & afternoon sun to look its best. It also requires good air circulation. Cold Hardiness: Rosemary will show damage if the temps dip below 20 degrees F. You can always bring your plant in for the winter months – see more on growing rosemary indoors further on down. Water: It needs regular waterings to get established. After then, infrequent & deep waterings (every 2-4 weeks depending on your climate) are fine. Good to know: be careful not to over water your rosemary because this plant is subject to root rot. Soil: Make sure the soil drains really well. What you add to amend drainage (if you need to) varies depending on your soil type. I added loam to my gardens. 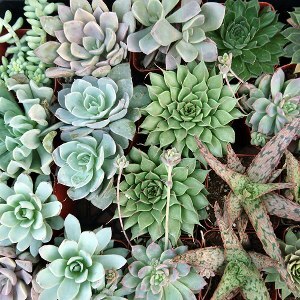 In a pot, succulent & cactus mix would be fine as well as potting soil; the latter you’d need to water less often. Rosemary isn’t particularly fussy as to soil type but I will say that it prefers a soil more on the alkaline side rather than acidic. 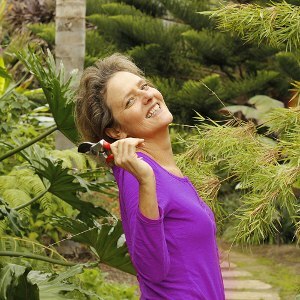 You can see my ginormous rosemary on the right – it grows behind & around my succulents. Fertilizer: Rosemary doesn’t require much if any at all. I’ve never fertilized but have composted them, every 1-3 years. If your rosemary is looking a bit yellow & pale, you could feed it once in spring with something like this. Propagation: Propagating rosemary is easy. I take cuttings about 5-8″ long (not the tender new growth at the ends but not the old woody growth either), strip off the lower leaves & put them in water. Make sure 2 or 3 of the bottom nodes are in the water because that’s where the roots come out of. When they put out substantial root growth, I plant them into that loose mix. Pruning: I would give this rosemary a really good pruning every spring after flowering. Because it grows so big, I needed to saw out whole branches to give it a better shape. Also, as those big branches grew, they would get heavy. I removed branches that were crossing over. Throughout the year I’d give it a light pruning to keep it in check. Depending on the size & shape of yours, you may only need to prune it when harvesting those fragrant tips. Pests: I’ve never seen it with any except for a little spittlebug in the San Francisco Bay Area which I just hosed off. I’ve read that it’s also susceptible to spider mites, mealy bugs & scale. Flowers: Oh yes it does! 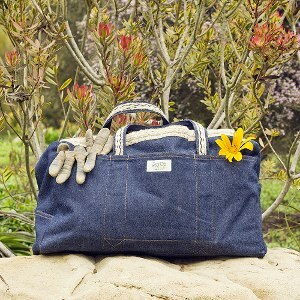 My “Tuscan Blue” has beautiful blue flowers which are abundant in the winter & spring. Then, it would bloom off & on but not as heavy. The bees love the flowers! Rosemary flowers are usually blue but different varieties can have white, pink & lavender/purple blooms. Good to know: in order to get your rosemary to flower, it needs full sun. The flowers of Rosmarinus officinalis “Tuscan Blue” – lovely to look at & a magnet for bees. Uses: Rosemary has so many uses in the landscape. It does great in containers & is very suitable to prune into topiary forms. Rosemary grows along the coast, in rock gardens, on banks as a ground cover, trailing over walls, as a hedge & of course in herb gardens. Good to know: rosemary is deer resistant. Indoors: Simply put, growing rosemary indoors can be a bit of a crap shoot. You want to make sure it has as much natural light as possible – high light. And, be sure not to over water it & be certain that all the water thoroughly drains out of the pot (make sure that there is a drain hole(s) & that it is not clogged. In the cooler, darker months, you’ll want to water it even less. Take it outside in the summer months if you can because it’ll love the sun & heat. To sum it all up, here are the 3 most important things that you need to know to grow rosemary: it needs full sun, well drained soil & not to be over watered. I did a video many moons ago about how I used that rosemary which you might find interesting. Rosemary is a plant I absolutely love and it tickles my fancy that there’s some growing right outside my patio wall. Time to go out and pick a bunch of it right now to bring into the house. Ahhhh …. that fragrance is like none other! This is Rosmarinus officinalis “prostratus” (or trailing rosemary) grows alongside the wash behind my house in Tucson, AZ. It gets no supplemental water & the summer temps have consistently been 100 degrees F plus. It doesn’t look too worse for wear! Thanks for all of your insights! I have Rosemary growing around my backyard in Palm Springs, CA and love it. Ironically, just last night we dined at an overpriced restaurant and sampled many items. The very best thing that was served was a heavily infused Rosemary dipping oil. My chicken (and the rest of the dish) was so bland that I dipped the chicken in the oil. Eventually, I poured the small bowl of oil over the dish. That gave me a new recipie idea; Chicken and pasta with drizzled Rosemary oil. Add some of your favorite green veggies and halved grape tomatoes and impress your family and guests. Wow. . I didn’t know they got that big! Thanks for sharing. I am in Kentucky! 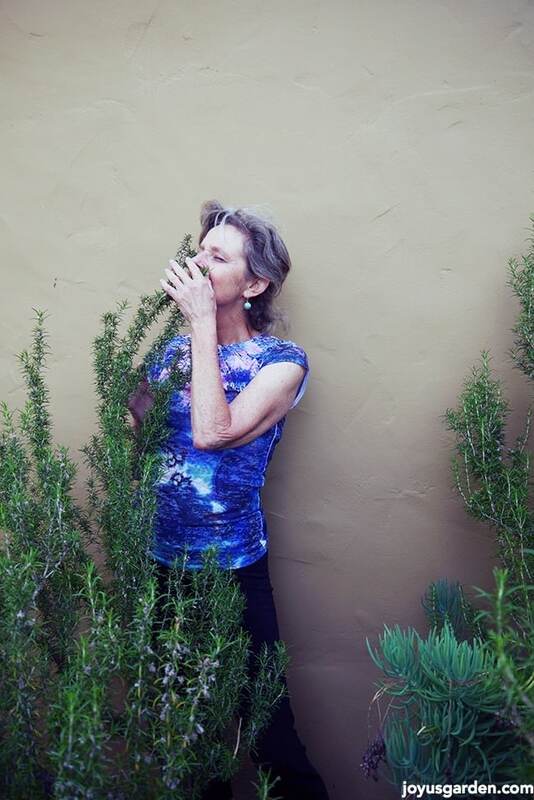 I am on my 4 th rosemary plant. I finally think I got it. I cut out the bottom of the container I bought it in, planted it deep, and it is flourishing. It has gotten 2 ft tall, and it so healthy, now I’m excited to see just how big it will get! Thank you for taking the time to do that. I have a ginormous trailing rosemary and while your advice is the first I have read on growning it, it is pretty much what I have been doing. I did not know that below 20 degrees was the *cutting off point* so now I will use a frost cover when we get one of those rare winter days in Texas. I do not want to lose it after three years. I am also happy to know how to root it. I didn’t have much luck with it is soil so will do the water bit ASAP. 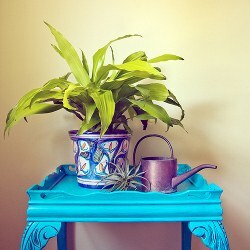 You probably possess a potted rosemary, you can make it indoors in containers when there’s the frost. Nell i had a great rosemary upright that was doing great. I added a second in the same large pot and it had accidentalky gotten pestiside on it that it did not like (the reason it was repotted) and eventually died anyway and was removed. Its been almost a yr since then and now im thinking it may not have been the pestiside that killed it because now my big rosemary has just shriveled up like it hasnt had water for a yr when it gets watered every 2 weeks without fail. What couldve happened? Do you know if deer or other wild life will eat rosemary? I have Rosmarinus officinalis in my garden it is a very good plant people attracted for its flavor my country we use it with roasted meat, others including me use it in tea preparation. Root rot due to over watering is good information to me. 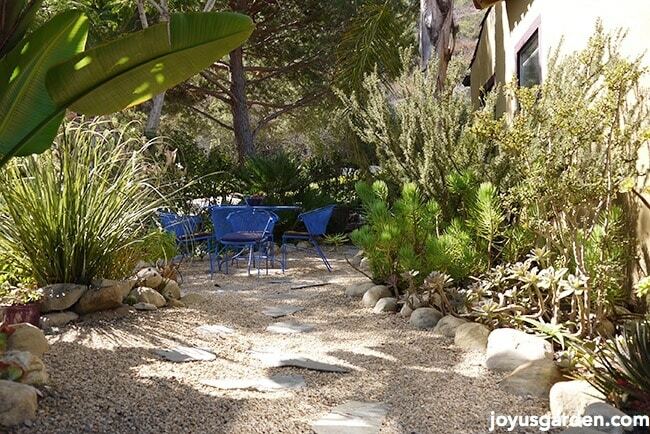 Hi, I love your meandering rock garden design and want to make a design plan using a curved rock pathway with a variety of rosemary and thyme. There is something very soothing to the senses with this type of garden along with a trickling fountain and garden benches nearby.